2000 years ago a grief stricken woman made her way to a tomb. Her name was Mary Magdalene & she had come to finish the burial rites that had not taken place due to the Sabbath for the man they called Jesus of Nazareth. It was very early ~ pre~dawn ~ but there was enough light to establish one inescapable fact: the stone sealing the tomb had been rolled away & the tomb itself was empty. Shocked & distressed she ran to find Simon Peter & John & together they returned to the tomb. There were the graveclothes; where was the body? The Jewish religious leaders would not have removed it. It would have made them unclean. The Roman authorities would not have removed it without the grave clothes it was wrapped in. The soldiers guarding the tomb would not have removed it: their very lives depended on it. Even after Peter & John had returned home Mary remained, weeping. It was as she turned to leave she saw someone standing there. I want you to note something. It the early morning light, in the gloom under the trees of the garden, Mary did not recognise Jesus. She mistook Him for the gardener. She was not expecting to find the dead among the living. She had expected to find a body in need of washing & rewrapping in herbs & spices. She *knows* that Jesus is dead. She saw Him die. She saw His broken body taken down from the cross. She knows the signs of death~ the blood separating into its component parts, the *dead weight*, the lack of breath. 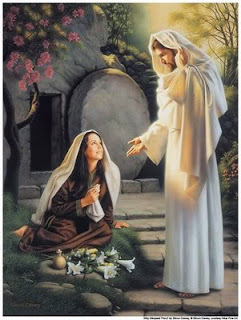 She has followed Him to the tomb & seen Him laid inside. Even so, how did she mistake a man she had followed for 3 years for the gardener? In her grief I suspect Mary did not really look at the man who confronted her in the garden but I also suspect she did not recognise Jesus clothing either. His robe, prayer shawl, sandals & belt were gambled for at the foot of the cross. Instead He wore a linen tunic, linen trousers, a linen belt, some sort of head covering & barefooted ~ which was the common garb of a gardener. Now this is absolutely fascinating because this is what the High Priest wore at Yom Kippur ~ the Day of Atonement ~ & what did the High Priest do on Yom Kippur? He entered the Holy of Holies to make atonement for the sins of the people! In the wilderness Jesus dealt with satan’s assault on the flesh, the soul & the spirit. On the cross Jesus dealt with the issue of mankind’s’ sin. One thing yet remained to be dealt with ~ sin in the heavenlies. Sin did not originate with mankind. It began in Heaven. It began with satan. It began with the angels who rebelled. I know of no approbation for the sin of angels. I believe the bible is very literal. Jesus is not metaphorically our High Priest. He is our High Priest. The duties of a High Priest fall to Him. And He had a duty to fulfill in heaven as our High Priest, the very first thing needed: He atoned for our sins in the heavenly temple. With His own blood. Shed for us. However when Jesus went to the cross, something happened that changed the course of world events. God tore the veil that lay between us & God. Though the Jews did not realise it the old order had changed. The High Priest disqualified himself when he tore his robes [Matt.26:65] according to Leveticus 21:10. The office stood empty over the Passover. Men may not have realised that but God did. The time of blood sacrifices was ended for the final, perfect & only acceptable sacrifice had been made. Jesus died as the Passover lamb; He rose as our High Priest & His first order of business was to enter the Holy of Holies in the Heavenly Temple & offer His own blood as appropriation for our sins. And because His was a perfect sacrifice it only needed to be made the once. Here is the thing: the resurrection of Jesus changed everything forever. He completely destroyed the works of satan. Yes, we still see them because satan is still the god of this world & people still give him his allotment of death, of suffering, of disease, of destruction, of robbery. But Jesus is coming again & when He does all that He achieved through His death on the cross will be fully implemented. But I have been redeemed out of the hand of satan by the precious blood of Jesus. I am a co~heir [Romans 8:17] with Jesus Christ & all the promises are mine to claim. Jesus has made everything new. 2 Corinthians 5:17 says: This means that anyone who belongs to Christ has become a new person. The old life is gone; a new life has begun! Or as the KJV puts it ~ old things are passed away; behold, all things are become new. The unregenerated life cannot live the Christ life. You must be made new & there is only one way for that to happen. John 3:3 Jesus replied, "Truly, truly, I tell you, no one can see the kingdom of God unless he is born again." John 3:36 And anyone who believes in God's Son has eternal life. Anyone who doesn't obey the Son will never experience eternal life but remains under God's angry judgment." So as we come to communion put aside Easter eggs & chocolate for they have nothing to do with the King of Kings. Instead consider Passover, with all its rich symbolism. Egypt symbolised sin, & the Israelites were brought out of Egypt as Christ brings us out of sin. Jesus, about to become the Passover Lamb, understood the enormity of what His sacrifice would achieve & we have considered all that is hidden in Passover when we celebrate the seder. In the garden of Gethsemane Christ laid it all down, even His very life. He was beaten that we might be healed. He was stripped naked that we might be clothed with His righteousness. He died that we might live. You can stand with the mockers around the cross & cry, If you are Christ ~ save yourself, or you can stand with the thief, acknowledge that you are a sinner & say, Jesus, remember me when you come into your kingdom.